Dog and Cat Clinic – Veterinarians in Leavenworth, Kansas – we want your pet to be happy and healthy! Welcome to the Dog & Cat Clinic! We want your pet to be happy and healthy! We are located off Metropolitan about 1 block east of Ft. Leavenworth's Main Gate. Looking for a Leavenworth Veterinarian? As you might guess from our Clinic’s name, we specialize in caring for Dog and Cats, and have been doing so since the 1970’s right here in Leavenworth, Kansas. 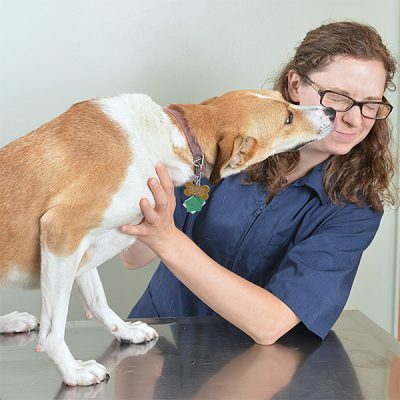 We’re small enough that you don’t have to meet a new vet every time you come in, yet big enough to provide the care you want and your pet deserves. Preventative checkups, shots, surgery, microchipping, prescription diets and pet food, along with pet boarding. Click below to view a list of the services we provide. If you have a pet-related emergency during business hours, contact us right away. We also provide after-hours emergency consultation and hospital referrals. Appointments are easy to schedule and we rarely have more than a 24-hour wait for routine appointments. To schedule an appointment, just contact us via email or phone and we can get you on the schedule. We're conveniently located in Northeast Leavenworth, 1 minute from Ft. Leavenworth and 6 minutes from Lansing. Want to schedule an appointment or have a question for us? We’re easy to get a hold of – and we respond to emails! While it’s great that we love animals (every pet clinic probably says the same thing), what’s fun about our clinic is that pets love us! Granted, we’re still vets and, let’s be honest, not every pet will be thrilled to visit — in the same way that you’re probably not always thrilled to go to the doctor or dentist. However, it’s a lot easier to go to the doctor or dentist when you like the person, and animals are the same way! That’s why we strive to be the friendly, compassionate, skilled, and local pet clinic here in Leavenworth. We are a pet care clinic located in Leavenworth and have been helping (primarily) dogs and cats live happier and healthier since the 1970’s.